Building a better community through the arts and education. 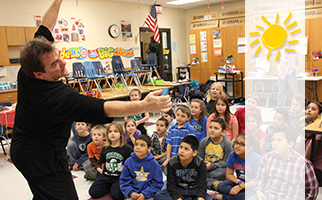 Arts Partners places professional teaching artists in schools—creating memorable educational moment around core subjects such as reading, writing and arithmetic. Programs happen through support from schools, PTO/PTA groups, grants and generous donors. Thank you for making Learning Through the Arts a reality. Please choose your desired donation amount. Donate 100% - Add 3% so that 100% of the donation goes to Building a better community through the arts and education..
Building a better community through the arts and education. has partnered with Network for Good to securely process your online credit card payment via Network for Good (tax ID 68-0480736). This transaction will appear on your credit card statement as "Network for Good." This transaction is subject to Network for Good’s Privacy, Security & Disclosure Statement and the Charitable Solicitation Disclosure.